J. Guerne Landscaping & Irrigation offers a variety of outdoor services that will fit all of your landscaping needs. From design to installation, we specialize in turning your visions into reality. Upon hiring your landscaper, personal consultations will take place to determine budget, design, colors, and maintenance for the new landscape. Jim will take you through all phases of your project and make sure that the end result is satisfactory for both parties. J. Guerne Landscaping takes pride in the work that they do! Residential landscaping is key in Florida, and one of our specialties. Whether you want to compete with your neighbor to have the best landscaped house on the block, or simply want to be able to have a nice view out of your window; we can help. From grading to putting that last finishing touch your your masterpiece, we're with you along the entire way. You will receive a one on one meeting with Jim (Owner) to discuss your personalized dreams. There are no limits, simple or complex, we can create a custom design for you! A successful business deserves an appearance as good as it's reputation. The first thing a customer sees when they pull into your office, complex, or building is your landscaping! Operating a company is stressful enough; let us take care of the landscaping. We can draw up plans in collaboration with an architect to insure that you are receiving up to code quality work. From commerce centers to small businesses, big or small, we handle it all! We offer fully automatic sprinkler systems with premium digital clocks, electric solenoids, pop-up sprinkler heads. 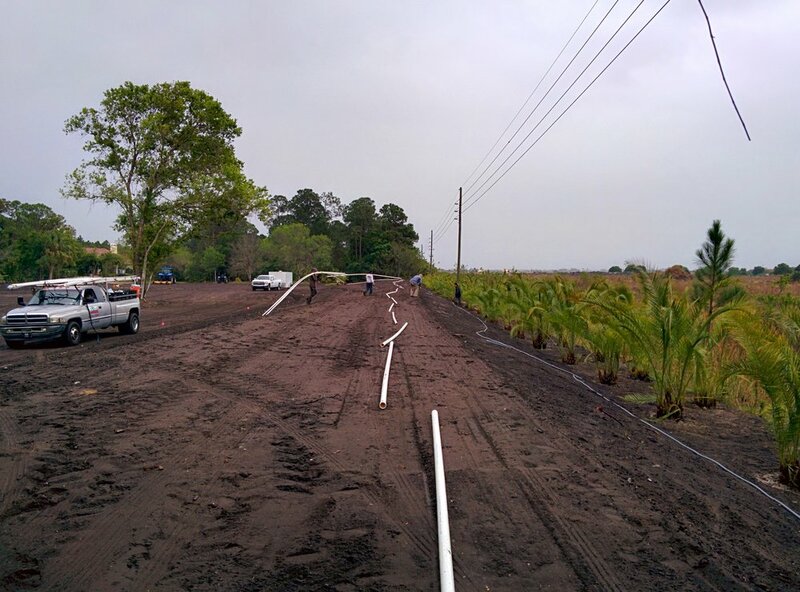 We offer quality care to your landscaping by segmenting it into precise zones that allow you to adjust the exact time for your system to run based on plant species, rain, and other environmental factors. With many areas still enforcing water restrictions in South Florida, we can design a system that will give your landscape the most efficient watering for your property. Low volume drip and misters for flowers, gardens and separate zones for grass and shrub areas. In conjunction with full system installs we also offer sprinkler maintenance packages for monthly, bi-monthly, or quarterly sprinkler checks to make sure your system is running properly. If you have an immediate problem we can provide one time sprinkler services which will include checking all zones, cleaning, and adjusting all sprinkler heads as needed. J. Guerne Landscaping Inc. can provide all aspects of landscape maintenance services. We have maintenance plans available to meet your needs - from basic service plans to full service maintenance plans. We can provide service for the smallest residential properties to the largest commercial properties. Full drainage installation is crucial in Florida, every year we experience countless cases where houses become flooded because they do not have the proper drainage implications installed. We create a precise route away from your home; no longer will you have to worry about mold, puddles, and pesky mosquitoes. Trees just like lawns must constantly be maintained. Whether your palms need trimming or you want to remove the yellow seed pods that are causing such an eye sore and attracting bees, we can handle it. Landscaping is something to take pride in, and having it visible 24/7 is a must for some individuals. Whether you're having a party or simply love enjoying the Florida weather outdoors lighting is crucial. You have the power to turn your backyard into an oasis, with discrete lighting for small bushes to tall palm trees. A must needed addition to beautiful landscaping is mulch and/or rock. Depending on the design of your landscape we can offer a range of mulch and rock colors + varieties to nicely blend with your color scheme.